How much do titanium watches cost? Why are titanium watches more expensive than gem-studded watches? Titanium watches offer a lot of advantages: They're lightweight as well as corrosion and temperature-resistant. Compared to stainless steel watches, they're about 40% lighter. Read on to learn more about different titanium watch models and prices. Prices for titanium watches range from inexpensive to extremely pricey. If you want to invest over 900,000 euros, for example, you can purchase a Jules Audemars Grande Complication from Audemars Piguet. At the other end of the price spectrum are titanium watches from Boccia. These are affordable quartz watches which cost between 100 and 200 euros. You can find new titanium Skagen quartz watches at similar prices. Since they're battery powered, these watches are also extremely thin. Luxury watches made of titanium usually have a mechanical movement, meaning they aren't battery powered. Watch connoisseurs differentiate between automatic and mechanical watches. You can purchase a pre-owned automatic titanium watch from Breitling starting around 2,000 euros. The price for a new Breitling starts around 3,000 euros. Their precise quartz-powered Aerospace is a bit more affordable and features both an analog and digital display. The men's titanium watch also has a calendar, alarm, timer, and world time function. With the integrated chronograph, you can stop time to exactly 1/100th of a second. Thanks to its extensive features, the Aerospace is well suited for pilots. Pre-owned models barely cost over 1,000 euros. New Aerospace models cost around 2,400 euros. The Avenger and the Super Avenger are two of Breitling's most popular titanium watches. The Super Avenger is an extremely large wristwatch with a diameter of 48 mm, but it remains lightweight due to the titanium. The Avenger is 5 mm smaller with a diameter of only 43 mm, but it's still quite large. An Avenger Seawolf, the diving watch in this collection, costs about 2,000 euros pre-owned. A new stainless steel model costs around 4,000 euros. This professional diving watch is waterproof to 3,000 m (300 bar). You can purchase a new Avenger chronograph for as little as 2,000 euros. New, it costs around 4,200 euros. The Super Avenger is similarly priced. Since the timepiece was replaced by the Super Avenger II, there are few new Super Avengers available. The IWC (International Watch Company) was one of the first watch manufacturers to produce titanium watches. The Schaffhausen-based company presented their first titanium watch in the early 1980s. At that time, Swiss manufacturers were using gold, platinum, or steel for their timepieces. A titanium wristwatch was revolutionary. The success of IWC's titanium chronograph was remarkable. Their titanium diving watch Porsche Design by IWC Ocean 2000 with reference number 3524 was also popular. Since this model is no longer produced, there are few available for purchase. If you find one, it usually costs around 4,500 euros. There are a few other titanium watches that Porsche Design made together with IWC. Plain three-hand models are very affordable and only cost around 1,300 euros pre-owned. You can purchase a pre-owned titanium chronograph from Porsche Design for about 2,000 euros. The Aquatimer is a typical IWC diving watch. It has an internal bezel that's controlled by an additional crown on the case. Normally, diving watches have a unidirectional bezel so you can keep an eye on your dive time. A titanium Aquatimer, waterproof to 2,000 m (200 bar), costs at least 3,000 euros pre-owned. Models with a chronograph caliber are only 100 euros more expensive. New IWC diving watches cost around 6,500 euros. The original IWC Ingenieur is one of the most well-known wristwatches featuring protection against magnetic fields. The company presented the first model of this legendary timepiece in 1955. In the early 1970s, the Ingenieur received a facelift. Gérald Genta, perhaps the most famous watch designer of the 20th century, developed a then-revolutionary design. Inspired by a diving helmet, he made the screws and holes on the timepiece visible. Today, only the Ingenieur Chronograph Sport offers protection against magnetic fields. A pre-owned titanium men's IWC Ingenieur costs at least 3,000 euros. The chronograph models are slightly more expensive. A new titanium Ingenieur with three hands costs around 5,000 euros. If you want to purchase a new titanium men's watch with a timer, you should plan to spend around 7,000 euros. The Swiss brand Hublot is known for their distinctive designs and excellent wristwatches. The timepieces from this Nyon-based company can be identified by their extravagant materials. Hublot is a pioneer when it comes to using rubber straps. They were one of the first companies to use this material for a strap. Their metallurgy and materials department also developed the patented Magic Gold alloy, the first scratch-resistant alloy in the world. The Magic Gold gold watches are 18 karat. Normally, 18-karat timepieces are prone to scratches, as gold is much softer than other materials such as stainless steel. Since Hublot mixes ceramic with the alloy, Magic Gold is much harder and scratch resistant than normal gold alloys. The price for a new Magic Gold Big Bang starts at 22,000 euros. The Big Bang is one of the most famous Hublot models. 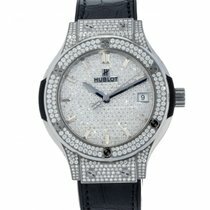 Hublot also offers titanium watches for sale. You can buy a new Classic Fusion with a rubber strap and quartz movement for around 3,600 euros. Paired with an automatic caliber and a crocodile leather strap, a new Classic Fusion costs around 4,300 euros. Variants with an automatic movement and a titanium bracelet cost around 5,400 euros. You should be prepared to spend around 10,000 euros for a pre-owned titanium watch from the Big Bang collection. 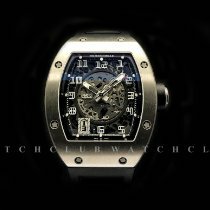 The prices for new watches start around 13,000 euros. Current Big Bang watches have the in-house Unico caliber with a flyback chronograph. If you want a Big Bang Unico with a titanium bracelet, you should expect to spend at least 15,000 euros. The watch's case has a diameter of 45 mm, making it more suitable for larger wrists. However, because the titanium case is so lightweight, you can still comfortably wear it. If you're a fan of diamonds, take a look at the Big Bang Unico Titanium Pavé Bracelet. Over 1,500 gemstones are on the case, bezel, and bracelet of this exquisite chronograph. This timepiece costs at least 65,000 euros. In addition to luxury titanium watches, there are also countless affordable titanium watches on the market, such as those from Boccia Titanium, Citizen, or Skagen. Boccia watches are particularly well known. The German chancellor, Angela Merkel, wears a wristwatch from Boccia. You can get your own watch to match the chancellor's for as little as 90 euros. Boccia has a rather large selection of women's watches. The German company also has titanium men's watches. Simple three-hand models with a titanium bracelet are available for 120 euros. Sports watches with a chronograph function aren't much more expensive; these quartz timepieces cost around 140 euros. 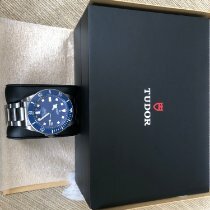 The top quartz watches from this manufacturer cost around 220 euros. These are titanium men's watches with sapphire glass. Boccia also has simple titanium models with three hands and automatic calibers. Prices for these more affordable watches start at 200 euros. The Japanese manufacturer Citizen is famous for their Eco-Drive quartz watches. These ecological watches are special because you don't have to change the battery. Most Eco-Drive models are powered via solar cells. A new titanium Eco-Drive watch costs only 180 euros. These three-hand quartz watches are rather plain and feature a date display. Pre-owned chronographs with this eco-friendly technology cost less than 100 euros. New models cost around 300 euros. Citizen also has titanium watches that receive radio signals. This means the time is synchronized with an atomic clock, making these timepieces incredibly precise; a watch telling the incorrect time is now a thing of the past. Prices for these watches from Citizen start at 450 euros. In regions where signals from an atomic clock can't be picked up, a wristwatch with a GPS timekeeping system is a good idea. This kind of watch receives signals from a satellite. The watches are ideal for bringing along on trips far away from civilization. 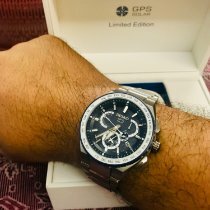 Top GPS watches are the Citizen Promaster Sky Satellite Wave Chronograph. Its PVD-coated titanium case has a diameter of 47 mm. Thanks to the coating, the watch is very scratch resistant and robust. The titanium wristwatch has a perpetual calendar, a stopwatch, an alarm, and a display that tells you how much power is remaining. It also has an incredible power reserve; it can run without any problems, even without being exposed to the sun, for 540 days. With the world time function on this multifunction watch, you always know what time it is in other parts of the world. This high-tech timepiece costs almost 1,700 euros. The Danish-American company Skagen Designs produces sunglasses, jewelry, and watches. Their flat quartz watches are beloved by many for their simple, Scandinavian design. Skagen Designs also has titanium watches on offer. Simple three-hand models are available for 100 euros new. Chronographs with a titanium bracelet and a sporty design only cost around 180 euros. The Skagen Jannik SKW6154 has a stopwatch and a trendy two-tone dial. Its retro look is very fashionable and appeals to a younger audience. With a plaited Milanese strap, the titanium watch costs around 220 euros. Titanium isn't a rare element. It's found in the Earth's crust as an oxide, a chemical compound containing oxygen and titanium. It can be found in minerals and rocks, such as rutile and ilmenite, as well as sand. The percentage of titanium in these substances is often very low. Titanium is predominantly mined in Canada, Scandinavia, and South Africa, as ilmenite is common there. Rutile and ilmenite are found in the mineral-rich sands of Argentina, Brazil, Florida, India, and on the west coast of Australia. Titanium mining requires a lot of energy and is thus very expensive. For this reason, titanium watches and straps are more expensive than comparable stainless steel watches and straps. Experts divide titanium into two categories: titanium alloys and pure titanium. Alloys are made of maximum 80% titanium. The other 20% is comprised of materials such as zinc, aluminum, or chromium. Pure titanium is when the material is 99% titanium. In the early 1980s, titanium was still posing problems for the watch industry. The manufacturers had to let the material cool down after every step, and it was difficult to work with. Polishing titanium is also more difficult than stainless steel. These factors likewise contribute to titanium watches being more expensive.